In a post-scarcity transhuman future Utopia, there is only one question worth asking. 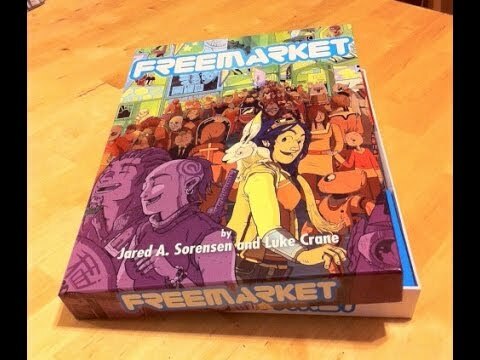 Freemarket is a role playing game that explores this question and the kind of world that would ask it in the first place. Conflict is mediated by cards in an elegant system that enforces an ebb and flow of success and failure. Created by Luke Crane and Jared Sorensen. Man, I still haven't played Freemarket. This needs to be rectified. They need to reprint the box set. Trying to do a print-and-play with all the cards and whatnot is going to be a headache if I ever pop for the PDF version. Also, did anyone notice that the Project Donut page that used to be up for Freemarket is now apparently a spam page for some Filipino realtor? Someone ought to let Jared and Luke know about that. They are very bad at Internet. It looks like they were using Wordpress for that site. I'm betting someone guessed their password or otherwise broke it and uploaded ze spam. Apparently only about 130 copies left. No reprints. Got mine ages ago. Still haven't played it. Still never getting rid of it. Someday! I bought it on the preorder years ago because I assumed they'd all sell instantly and we'd never see it printed again. I still desperately want a copy, and I still desperately can't afford it. I will be running this soon for my group! An actually series of sessions, not just a one-shot!! At Okeefe's direction late last year I bought the Operator's Manual PDF for $5 and made decks of cards using energies from old pokemon decks. We had a lot of fun playing the one-shot at Burning Con and are extremely curious to see how an actual campaign pans out. My friend bought a boxed set yesterday from the BW web store, so between us we should be good to go. Just have to find the time.